I recently had the pleasure of sitting down for a sushi dinner with Rachel Fox Kipphut. We had never met before, but I had always admired her beautiful family, style and photography through Instagram and we were both local to Raleigh. I had the idea of sharing some glimpses into her super cute home on my blog and meeting seemed like a great idea too! She was warm and friendly and we talked for hours about everything. I got to know more about her (she is a photographer & stylist) and also her sweet family and background. Rachel is very passionate about building a community that supports and advocates for children and individuals with different-abilities and Down syndrome. 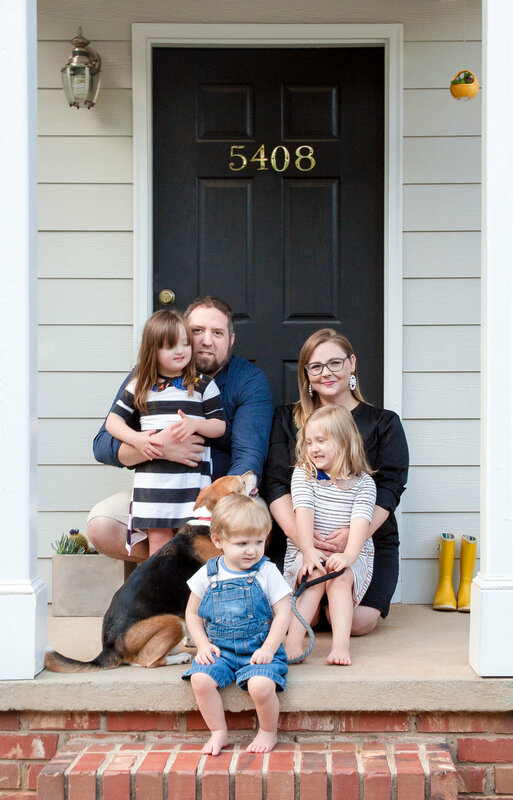 Their oldest daughter Eva has Down syndrome and they have found a great support system from the Raleigh community which has helped her grow and thrive. They live and work in an 1800 square ft townhome with three kids and one dog. They make great use of all the space in their home and have really tailored it to their needs, but also to the needs of their young children. 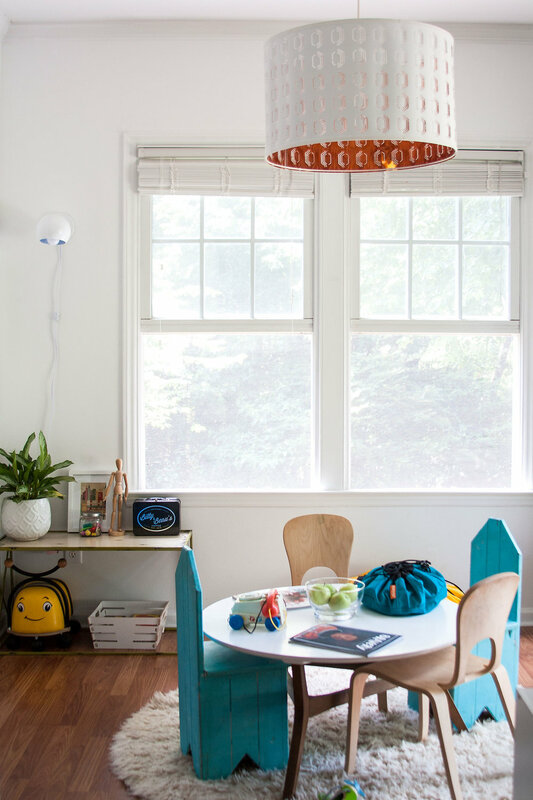 As a mom of young kids myself, I know the challenges of trying to keep a house clean and organized but also a fun and safe place for your kids to play, be comfortable and adjust with the always changing stages. 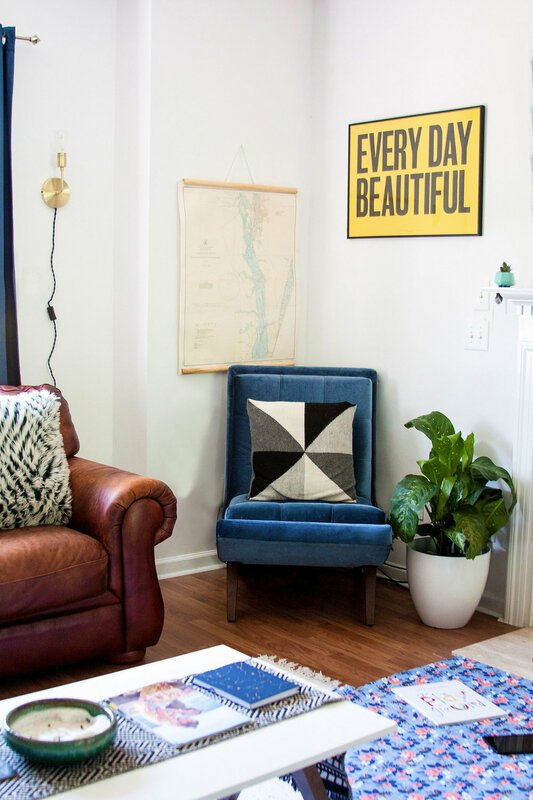 Rachel and her husband Scott have done an amazing job of fostering creativity and style into their Raleigh home. Let's take a peek! 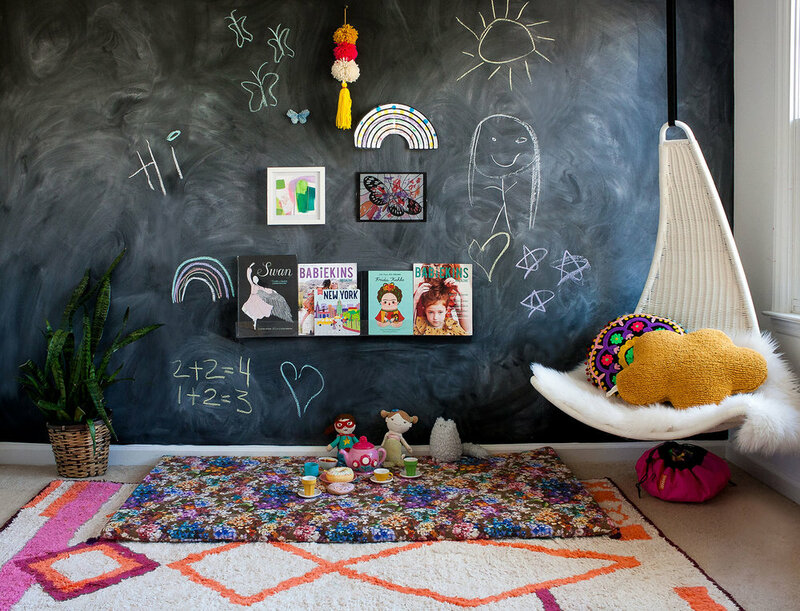 Their daughter Eva was a born artist and draws on every surface she can find, so they loaded down their home with removable chalkboard wallpaper! I think I may need to steal this idea as my Zora is known to draw on all the things in our home! Their living room is comfy and cozy with lots of vintage and personal touches. That Everyday Beautiful print from Schoolhouse Electric really speaks to what Rachel and her family are all about: that beauty be inclusive to all looks, shapes, sizes, abilities, nationalities and genders. I love the multi-purpose kid's dining/play area. Such a fun and smart idea! The pops of color in the books, accessories and art against the white walls are so happy and alive! 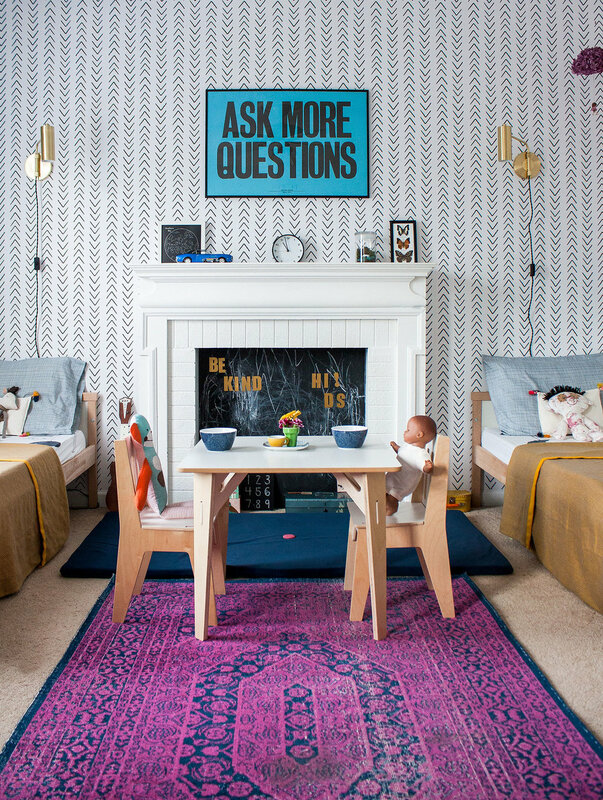 This kid's space feels so fun but also sophisticated and styled so well! And I really want that Rock On print! 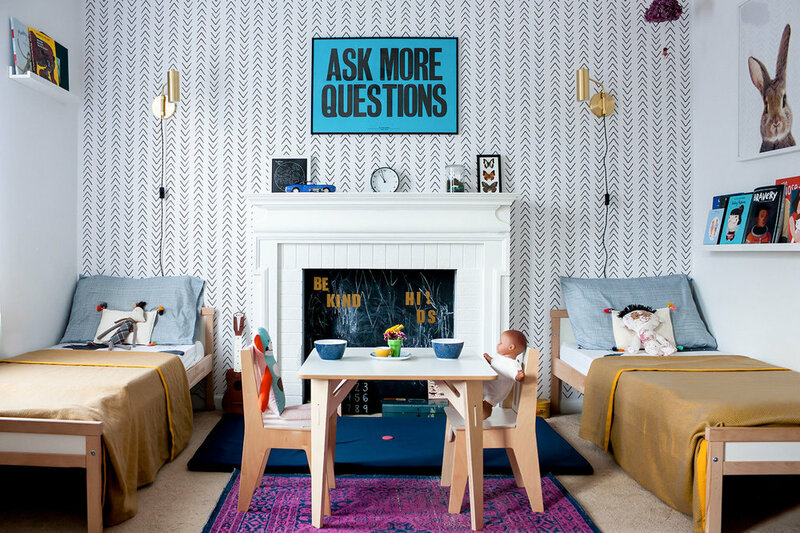 I'm really taking all sorts of inspiration for our playroom from this setup! Isn't the chalkboard wall just so cool? The swing is great for play and balance and helps to strengthen Eva's core muscles. Most children with Down Syndrome need to work harder to build muscle strength due to low or weakened muscle tone. This shared room is a dream! Part style but also so much function here! The black and white graphic removable wallpaper adds so much character to the room. And the color choices feel so fresh and modern. By far my favorite space in Rachel's home! Thanks so much to the Kipphut family for letting me share their lovely home! I'm so inspired to create more fun and functional spaces in my own home!